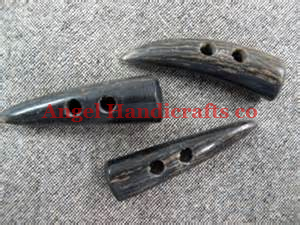 We are manufacturing & supplying Real Horn Toggles made from Buffalo Horn. It is also called Horn Toggles, Buffalo Horn Toggles, Duffle Button, Horn Buttons etc.The exquisite range of Horn Toggles provided by our company is an excellent example of artistry and craftsmanship. 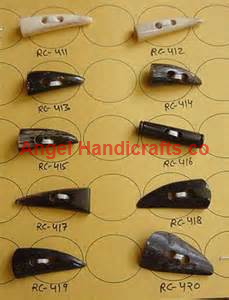 These real Buffalo Horn Toggles symbolizes ethnicity blended with contemporary style. In order to comprehend and meet the diverse requirements of esteemed clients, we are able to offer a superior range of Duffle Button. The offered range is made utilizing high grade raw material and modern machinery in complete adherence with highest quality norms and standards. Furthermore, the offered range of Duffle Buttons is tested on varied characteristics to maintain its authenticity throughout the entire designing process. We are comprehensively engaged in offering an unparalleled range of Natural Polished Horn Toggles. The offered range is manufactured utilizing high grade raw material and innovative technology in complete adherence with the highest quality norms and standards. Along with this, the offered range is available in different customized specifications such as sizes, shapes and allied in accordance with the diverse requirements of clients.